Richardson Electronics supplies high quality, high precision, Swiss-made laser nozzles. We are among the world's leading laser nozzle distributors, and our superior products ensure peak performance from your laser machine. Our laser nozzles are precision machined to meet or exceed the tight tolerances required in laser cutting. Because nozzles are replaced so frequently in laser machines, we always deliver the best possible prices for these consumables. However, Richardson Electronics will never compromise on quality, and we offer only the best replacement laser nozzles. 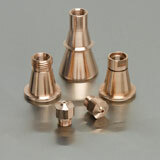 We supply copper and hard chromium-plated replacement laser nozzles for all major laser manufacturers. Whether you have a TRUMPF® laser cutter, an Amada laser, or another make, Richardson Electronics' laser nozzles are guaranteed to fit perfectly on your machine. We offer an extensive selection of nozzle sizes and configurations to cover the full range of laser capabilities. In addition to our top quality laser nozzles, we also supply a number of nozzle accessories and components. We have nozzle holders ("ceramics"), protective Teflon covers, locking nuts and more.